A HUMAN PERSPECTIVE Noah Idechong has fought to protect the sea life of Palau, an archipelago east of the Philippines. Palauans have always earned their living by fishing, but in the 1980s, many species of fish were in danger of extinction because they were such popular menu items in Asian restaurants. Idechong began to study the problem in 1988. His efforts paid off. In 1994, the year Palau became independent, it banned the export of certain species, and fish populations grew again. However, in 2000, the government planned building projects that would help the economy but strain the environment. Idechong kept working to save wildlife. He said, “Palau right now needs . . . people who can say what they want Palau to look like 50 years from now.” In other words, Palauans need to decide what to preserve in the face of change. Like Palau, all the nations of Oceania except Nauru are island groups. They are Fiji, Kiribati, Marshall Islands, Federated States of Micronesia, Palau, Papua New Guinea, Samoa, Solomon Islands, Tonga, Tuvalu, and Vanuatu. Prehistoric people journeyed from mainland Southeast Asia to nearby Pacific islands using small rafts or canoes and land bridges that have since disappeared. In time, they developed large voyaging canoes that enabled them to sail longer distances. For thousands of years, their descendants continued to migrate as far east as Hawaii, as far south as New Zealand, and as far west as Madagascar. For centuries, the people of Oceania had little contact with the rest of the world, so they developed their own ways of life. Geographers divide Oceania into three regions, defined both by physical geography and culture. Beginning in the 1500s, many Europeans explored the Pacific. Perhaps the most famous was the British captain James Cook, the first European to visit many of the islands. In the 1800s, European missionaries arrived and tried to convert the islanders to Christianity. Traders came for products such as coconut oil, and sailors hunted whales. Settlers started plantations on which they could grow coconuts, coffee, pineapples, or sugar. As a result, island societies began to decline. Many islanders died of diseases brought by the Europeans. Western ways often replaced traditional customs. And Europe and the United States took control of the islands and turned them into territories and possessions. Oceania experienced turmoil in the 20th century. During World War II, the Allies and the Japanese fought fierce battles there to gain control of the Pacific. Afterward, some islands were used as nuclear test sites, not only by the United States but also by other countries. Gradually, inhabitants of many of the islands moved toward self-rule. Since 1962, 12 different nations have gained independence. Foreigners still rule the other islands. Most of Oceania has an economy in which people work not for wages but at subsistence activities. These are activities in which a family produces only the food, clothing, and shelter they themselves need. The tiny island of Nauru is an exception. It has a prosperous economy based on the mining of phosphates, used in fertilizer. But Nauru’s phosphate deposits are expected to give out early in the 21st century. As Chapter 30 explained, most low islands do not have plentiful or fertile soil. In spite of this, agriculture is the region’s main economic activity because many high islands do have soil that supports agriculture. The chief crops are bananas, sugar, cocoa, coffee, and copra, which is the dried meat of coconuts. Fishing also provides a significant source of income. Since the invention of jet travel, tourism has become very important to the economy of Oceania. This has been a mixed blessing. Although tourists spend money in the islands, they also require hotels, stores, roads, and vehicles. These threaten the islands’ environment and traditional ways of life. A few islands besides Nauru have mining industries. For example, Papua New Guinea is developing a large copper mine with the help of foreign investment. Some industry also exists. Some of the larger towns have factories that produce goods such as coconut oil and soap. 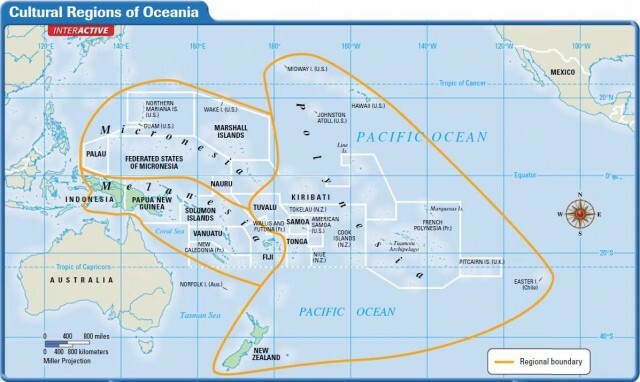 Oceania has a culture that blends traditional ways with the cultures of Europe and the United States. Oceania is one of the most linguistically diverse regions in the world. Some 1,100 of the world’s languages are spoken there. The people of Papua New Guinea alone speak 823 languages. In addition, many Pacific Islanders speak European languages. English is the most common. Because of missionaries’ work and colonialism, Christianity is the most widely spread religion. Even so, some Pacific Islanders still practice their traditional religions. Many Pacific Islanders produce arts and crafts, such as baskets and mats woven from the leaves of palm trees or carved wooden masks. Some islanders make a living selling such items to tourists. As in Southeast Asia, two distinct ways of life exist on the islands: traditional village life and more modern city life. Ways of life varied throughout the islands. In Polynesia, most people lived in villages, ranging from small clusters of houses to large walled settlements. The houses were usually wooden with thatched roofs. Generally, a chief led each village. The villages’ economies centered on fishing and farming. One major crop was taro, a plant with a starchy root. Taro can be eaten boiled, or it can be made into breads, puddings, or a paste called poi. Many Polynesian societies were warlike and had frequent conflicts. In contrast, Micronesians tended to exist peacefully with their neighbors. Most Micronesians lived in extended family groups. As in Polynesia, they made a living by fishing and farming, with taro being a main crop. In Melanesia, villages usually existed by the coast where people could fish. Inland, many people practiced shifting cultivation, moving often to let fields regain fertility. Other Melanesians were hunter-gatherers. Oceania has few cities, but they have been growing as many people move to them for education or jobs. Rapid urban growth has led to sprawling shantytowns and inadequate sanitation facilities. In addition, city dwellers are giving up their traditional ways of life. But change is also helping Oceania. Modern communications systems can unify countries consisting of scattered island groups and also can link Oceania to the rest of the world. Section 3 will describe the two most westernized nations in the region: Australia and New Zealand.